February 27, 2018 - Gumstix® Inc., the leader in design-to-order embedded systems, announces the release of the Gumstix Chatterbox for the Colibri iMX7, a development board for Amazon’s Alexa Voice Service (AVS), along with a new Toradex Colibri iMX7 System on Module (SoM) connector module in Geppetto®. Both support the Toradex Colibri iMX7, a powerful IoT System on Module (SoM) with an ARM® Cortex-A7 CPU, integrated Cortex-M4 microcontroller and a full complement of features including audio codec, DDR3 RAM and power regulation management. Designed by Gumstix in Geppetto following the AVS Functional Design Guide, the Chatterbox can be deployed as a voice or push-button activated Alexa device. The Chatterbox includes a 2.5-Watt speaker driver, on-board microphone and line-in jack for high-quality audio I/O, and Wi-Fi, Bluetooth and Ethernet for connectivity. These features accompany the Toradex Colibri iMX7 module, microSD storage and real-time clock for a complete home companion platform. The Colibri iMX7 (Toradex) Geppetto Module is a SO-DIMM connector and support electronics for the Toradex Colibri iMX7 SoM featuring the NXP® i.MX 7 Processor at 1.0GHz. With the Geppetto® D2O platform, IoT designers can now design and order iMX7 hardware with any network connection and hardware feature they choose in minutes. During the design process, users can compare alternatives for features and costs, create multiple projects and receive complete custom BSPs and free automated documentation on demand with all saved designs. Designers are able to go straight from a design to an order in one session with no engineering required. The i.MX 7 family of NXP® SoCs is an ideal platform for many embedded and IoT applications. 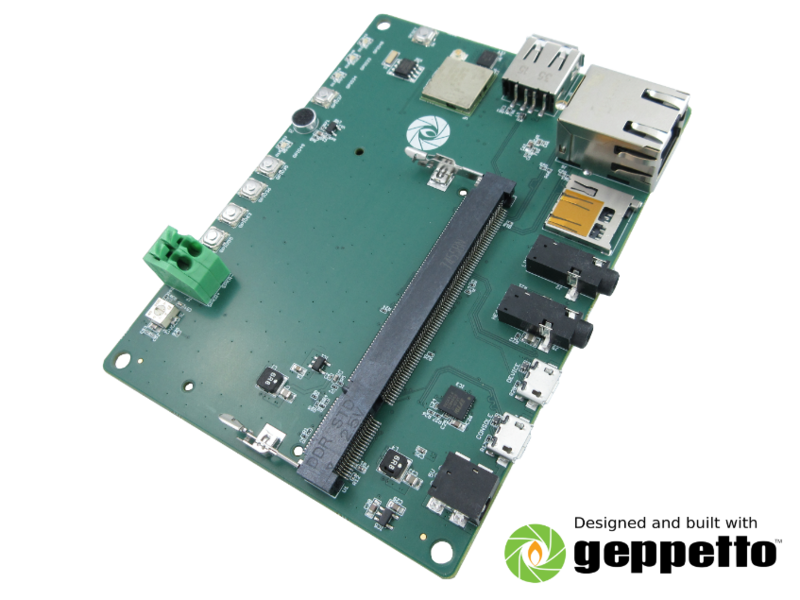 “Gumstix provides an excellent service, allowing our customers to get customized carrier boards in a fast and simple way. When using Toradex SoMs, customers profit from free Toradex support and lifetime maintenance for Software and Hardware of the SoM. Toradex is looking forward enabling more of our modules on Gumstix Geppetto” says Daniel Lang CMO, Toradex.